Laser marking, rapid prototype, trimming, radar etc. High speed fly marking, high speed marking. Precise marking, prototype, trimming, radar. 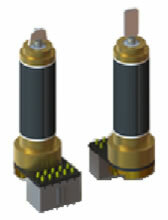 OSSL series galvanometer scanners are high-performance rotary motors for optical applications. They consist of a motor section based on moving magnet technology and a high-precision position detector. The primary area of application is the fast and precise positioning of mirrors for the deflection of laser beams. The exceptional dynamics OSSL Series scanners are the result of years of experience in developing and manufacturing scanners, scan systems and scan solutions for industrial use. The motor section of each OSSL series is ideally matched to the inertial load presented by the mirror. 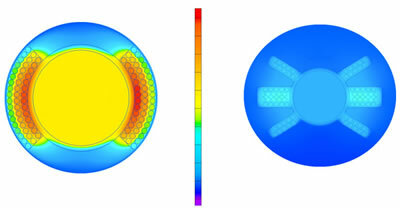 The optimized rotor design is largely responsible for the favorable dynamic properties and resonance characteristics. Axially pre-loaded precision ball bearings guarantee a backlash-free rotor assembly with high stiffness and low friction. Special attention has been paid to long bearing lifetimes. The optical position detector system is characterized by high resolution, as well as good repeatability and drift values. The scanners are equipped with heaters and temperature sensors. This allows temperature stabilization for further enhancing long-term stability, even under fluctuating ambient conditions. We provide all OSSL series scanners with suitable mirrors and mirror coatings for all typical laser wavelengths. In addition to very good reflection properties, the mirrors are also optimized with respect to inertial load, stiffness and flatness. The high quality of OSSL Series galvanometer scanners enables error-free operation in long-term and continuous use. Comprehensive measurements on custom test benches assure that the highest level of quality is continuously maintained. The rotationally symmetrical flange facilitates mounting. The scanner housing must be electrically insulated from the machine structure. Mirror stops are already integrated into the scanners. The mirror is directly bonded to the scanner’s shaft. 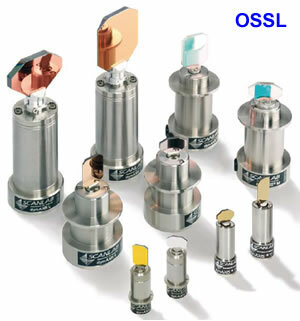 Click here for the dimensions of OSSL series galvanometers. 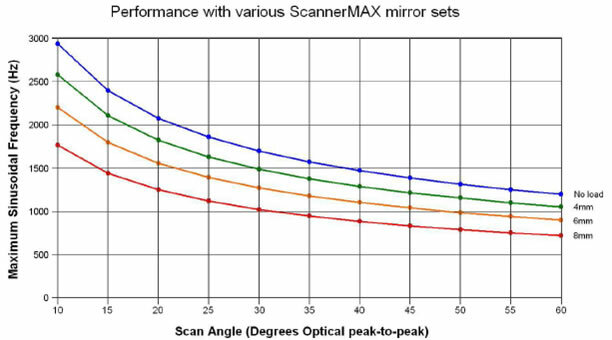 Stronger, Cooler, Faster, ScannerMAX optical scanners utilize a revolutionary new design which allows them to outperform anything else available on the market today. Conventional galvanometer’s have many known limitations, which have stifled laser applications from moving forward. The ScannerMAX design addresses these limitations, and provides clients with a proven solution to their laser scanning needs. 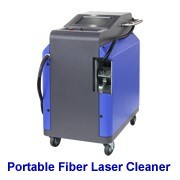 Currently ScannerMAX scanners are available in one version, called the Saturn 5 Optical Scanner. This version is ideal for 3mm – 8mm aperture applications. The Saturn 5 optical scanner is specifically designed to meet the high acceleration and high RMS duty cycle demands of projection and imaging applications such as laser entertainment displays, raster imaging, Confocal Microscopy and Optical Coherence Tomography. The Saturn 5 is capable of moving a 3mm beam through an optical angle of 30° at a frequency of over 1,600 Hz with a sinusoidal drive. Step response times can be as low as 100 microseconds for a 5° optical step and under 500 microseconds for an 80° optical step. In addition to its high-speed capabilities, the Saturn 5 incorporates several very desirable design features. First, because of its half-inch-round body dimensions, the Saturn 5 is easily retrofitable into many existing systems. Second, the integral back-supporting mirror mount virtually eliminates “diving board” bending-mode mirror resonances while also easing field replacement of mirrors. 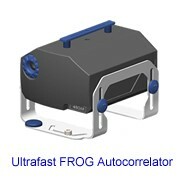 And finally, the high-output, low-noise position detector enhances short-term repeatability and minimizes dither. The newly-developed X3 magnetic circuit boasts air gap flux densities of over 14,000 Gauss. The intense magnetic field strength, combined with the very low coil resistance and low rotor inertia, gives the Saturn 5 the highest peakand RMS-torque-to-inertia ratio of any commercially-available optical scanner. Instead of placing turns of copper wire in between the steel and magnet, we bury our wire in slots within the steel, which maximizes flux density. As a result, fewer turns of copper wire are needed to create the same amount of torque, thus inductance is no greater than in a standard galvanometer scanner. In addition, we use a thicker cooper wire inside of our unique slotted design, which allows our scanner to dissipate the heat better than current industry standard galvanometer’s can. We combine this with a much stronger shaft, which is 3mm in diameter vs. the common 2mm in diameter, used by many of today’s standard galvanometer’s and we position the mirror closer to the magnet. The end result is a much stronger scanner, which can operate at cooler temperatures, allowing our scanners to perform at much faster speeds. * Specifications in parenthesis indicate Saturn 5 version AW-52, which offers an alternative stator winding. * Saturn 5 version AW-52 has a higher coil resistance and is easier to drive for typical servo amplifiers. 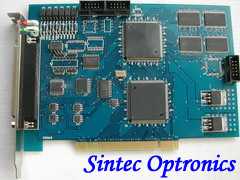 Specifications are at a temperature of 25° C. All mechanical and electrical specifications are +/-10%. 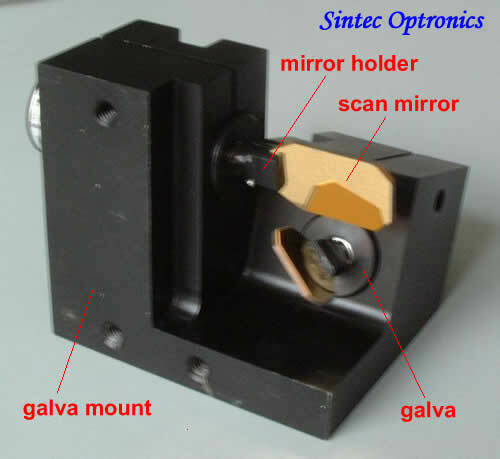 Standard two axis X/Y (galvanometer) mounts and mirror sets from 3mm to 50mm apertures. 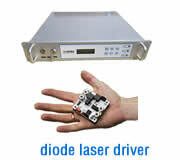 Standard laser marking heads, D/A card and software control. Standard and Custom Interface Cables. Standard and Custom scan lenses for laser marking machines. 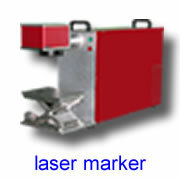 Standard and Custom beam expanders for laser marking machines. 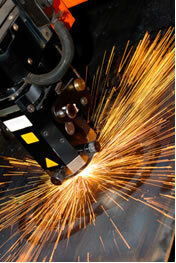 Laser material processing includes applications such as laser marking, engraving, cutting, scribing, trimming, drilling and welding. In these applications two galvanometer scanners are used in an X-Y configuration to direct a high-intensity laser beam to a target piece of material. In the case of laser marking and engraving, the material is often a plastic electronic part, such as an integrated circuit or connector. In the case of laser cutting and scribing, the material is often wood, metal or plastic, or even silicon such as integrated circuits or photovoltaic solar cells. In the case of trimming, the target material may be a resistive material on a resistor, whose resistance is adjusted by removing material. In the case of drilling, the material can be metal or even FR4 glass epoxy circuit board material. One of the most recent laser material processing applications is textiles, such as blue-jeans. The laser projects patterns onto the blue jeans material to give it an aged or worn appearance, or to create unusual textures. 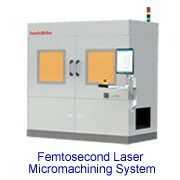 Laser material processing is generally not an application which demands thermal performance from a galvanometer, but generally does demand high bandwidth and low resonances. 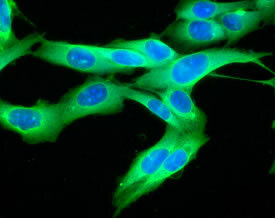 Biomedical applications include applications such as Confocal Microscopy, Optical Coherence Tomography, Opthamology and Dermatology. Like Laser Material Processing, these applications involve two galvanometer scanners used in an X-Y configuration, but unlike laser material processing, generally the laser beam is of a smaller size and lower power level. In the case of both Confocal Microscopy and Optical Coherence Tomography, the X axis scanner is used to scan a fast, sawtooth-like pattern while the Y-axis scanner is used to sweep the line created by the X axis downward and upward across the tissue being examined. This is essentially a raster-scanning application, but with additional performance demands, since the X-axis scan often involves beam power calibration on each scan. This application is particularly demanding of the thermal performance of galvanometers because of the heat generated by continuous high currents applied to create the X-axis scanning motion. In the case of Opthamology and Dermatology, these applications are less demanding in terms of both heat and resonances, because the motions are generally slower, smoother vector-oriented motions. Generally dermatology is not at all a high-performance application, but rather one that requires very light weight. 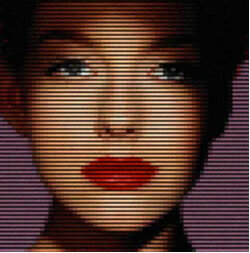 Laser projection applications include laser entertainment (i.e. laser light shows), and Optical Layout Template (OLT) applications. 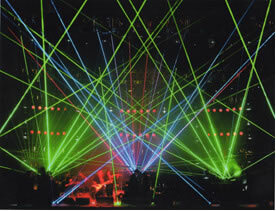 Laser light shows have existed for more than 35 years, at amusement parks, concert halls, night clubs and special events. Laser light shows present some of the greatest demands to galvanometer scanners because of the wide range of patterns projected over a range of angles which are usually wide angles. Optical Layout Templates involves using a laser projection system to project a template pattern which is generally originates as a CAD file. The projected pattern often serves as an aid for humans who use the template to assemble large plies of material such as roof trusses or multi-part aircraft wing structures. The projected template can also act as a guide as to where leather or cloth will be cut during a separate operation. Often times both laser light show and OLT applications present both thermal and resonance demands to a galvanometer system. Stereo lithography involves two separate X-Y galvanometer scanning systems, each directing a laser beam to a target liquid-like material. Where the beams meet, a chemical reaction is formed which cures the material. Such formations happen layer by layer to create a solid, three-dimensional part. The part can be used as a prototype, or simply as a mock, to examine a prospective design before committing it to a more permanent and expensive material. Galvanometers can also be used along with other types of scanners, such as resonant scanners or polygonal scanners, to create raster-scan patterns for direct-to-plate or direct-to-film printing applications. Stereo lithography and printing applications are generally demanding of the positioning repeatability capability of a galvanometer scanner. 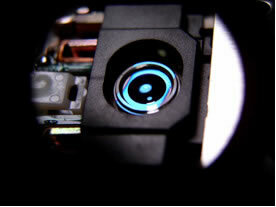 Image capture involves using galvanometer scanners to effectively position a camera on a target surface. This is unlike all of the other applications mentioned above. Instead of a stationary laser beam projecting light off of two galvanometer mirrors to reach a target spot, a stationary camera is placed into the path of the two galvanometer mirrors, which allows those mirrors to position the camera’s view anywhere on the target surface. Imaging applications are generally not very demanding of a galvanometer, since this is most often a kind of “move and hold” application. As you can see, there are a wide range of applications that are currently being served very well by galvanometer scanners. We believe that there are more applications that have yet to be discovered. Please contact us to discuss your requirements. We will be happy to explore how galvanometer scanners may help in your application.